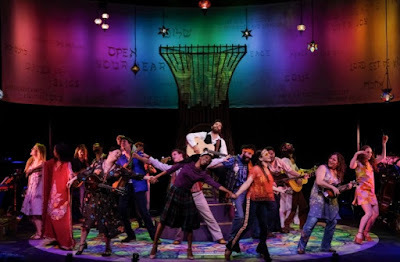 Carol's Theatre Reviews ~ It's Fun To Go Out: Soul Doctor’s Journey Brings Him Back To San Diego. Soul Doctor’s Journey Brings Him Back To San Diego. 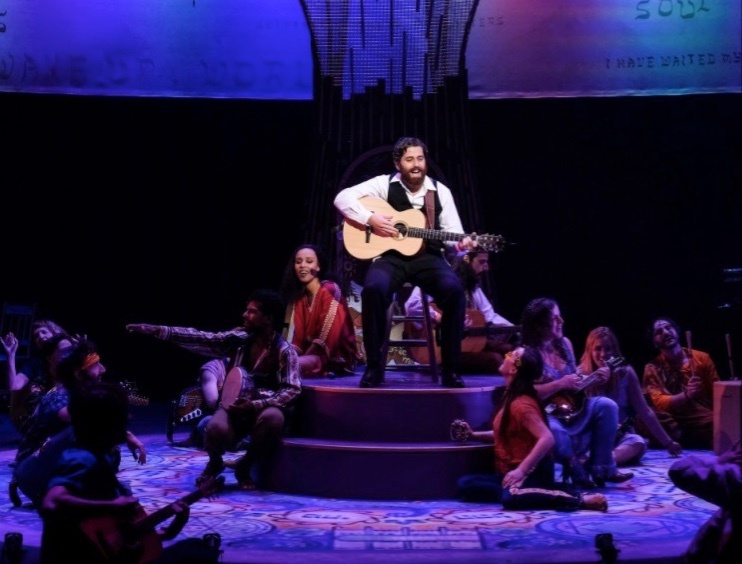 When Rabbi Shlomo Carlebach sang at a concert at Temple Beth Israel here in San Diego in 1967, the concert lasted two hours and was met with some measure of controversy. Folks in the congregation were not used to men hugging women, (that was part of his openness) and some in the congregation were not comfortable with his concert being held in the sanctuary. They thought it should have been held in the social hall. While still steeped in the Hassidic Movement, he promoted the ‘spiritual right’ of women and defended a woman’s right to read from their own Torah Scroll at the Kotel (Western Wall). As Jewish spiritual leader of a hippy movement in the late 1960’s in a sanctuary called ‘The House of Love and Prayer’ in San Francisco, in Haight Ashbury to be exact, he thought he could reach more disenchanted, drug induced and lost students than if he remained in N.Y. He settled in San Francisco after an appearance in the Berkeley Folk Festival in 1966. His message and music of peace and love resonated there, his minions grew and his music, now recorded, was known from coast to coast. He rocked the Jewish Orthodox community to its core when he moved to San Francisco and began his own form of orthodoxy. His rabbi father, (Martin Rayner) founder of a small synagogue in New York’s Upper West Side was, most would agree, a traditionalist and NOT HAPPY! To say that the elder Rev. was dumfounded and angry at his son’s choice to move away from his synagogue and start his own would be an understatement. 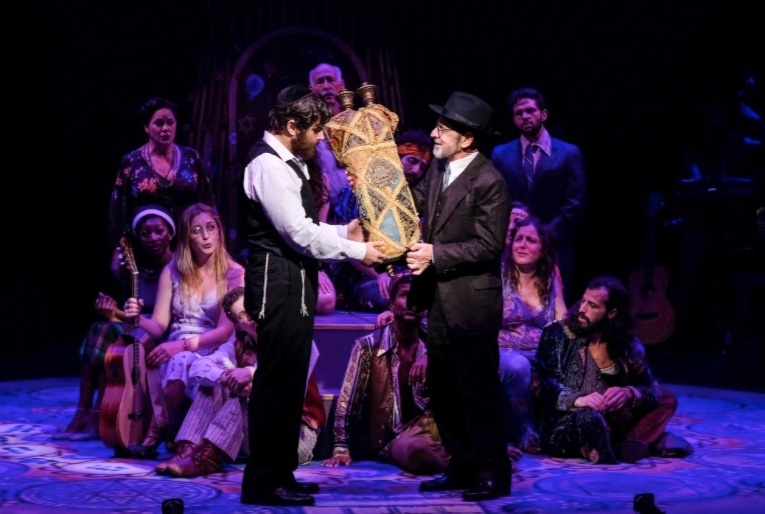 Think the same disconnect with Tevye and Chava in “Fiddler on the Roof” or the same father son conflicts in “The Jazz Singer”. There is only black and white in Jewish Orthodoxy. This branch of Judaism adheres to the strict interpretation of the laws and ethics of the Torah as written in the text. Men and women did not touch unless married, and when they prayed in synagogue they (are) were separated by a partition; a physical barrier, a screen or a curtain called a mechitza. Young Schlomo knew that his father’s brand of Orthodoxy was a turn off for most of young Jewish male students. They were and were leaving the fold and not returning. He decided on his own to reach out to Jews of all persuasions and then some outside the Jewish community to join in his committment to peace and understanding. After all this was the 60’s and “The Age of Aquarius”. 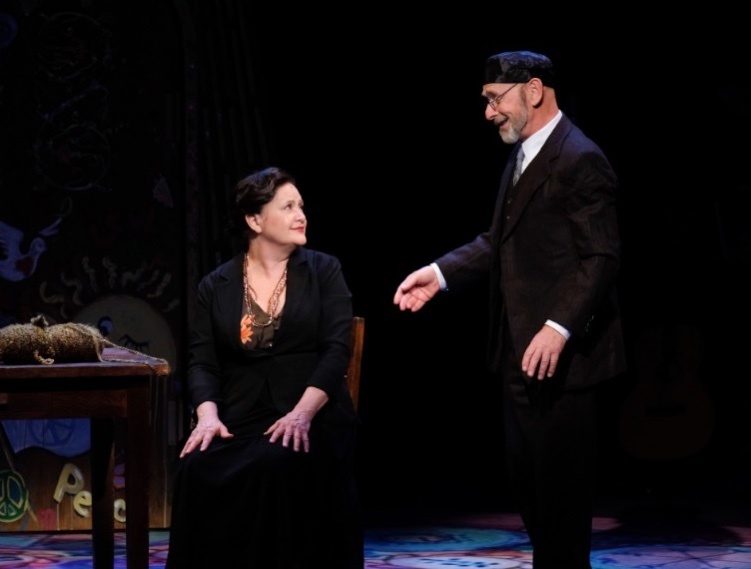 Carlebach broke down some of the orthodox barriers after a so -called encounter with one of his followers, Ruth (Ginna Doyle versatile in many areas especially on her violin) who reached out to him for comfort and he drew back in horror as if he would turn to stone. Sadly in his personal life his accusers of sexual misconduct tell a different story. “The Soul Doctor” now playing at the San Diego’s Repertory Theatre for a limited run through April 22nd begins in Vienna (he was actually born in Berlin) where he and his family lived and prospered until the Nazi’s forced them out of their home. His story weaves in and out of family crisis to career building as he trolls the New York club scene and Greenwich Village where he came in contact with Bob Dylan, Peter Seeger and with a sly hint (in the script) that the young rabbi (played by an enormously talented Josh Young) had a brief encounter with Nina Simone (Ester Rada an Israeli from Ethiopia and a celebrity in her own right ) as well. While both were climbing the ladder of success he composing and hoping to get a recording session while simplifying and interpreting some of the liturgical music to simple and repetitious (Die di-dedie-di and lalala and “ya-ba-bay) melodies and whistling in a meditative trance, and she trying to get a concert date in Carnegie Hall. One still very much his ‘Am Yisrael Chai’ brought the house down on opening night and prompted everyone so inclined to do the Hora on stage and dance with the cast as a final love in (so to speak). With book and libretto (co-creator) by David S. Wise and lyrics by David Schecheter with music and additional lyrics by Carlebach, “Soul Doctor” opened on Broadway in 2013 staring our own Eric Anderson. 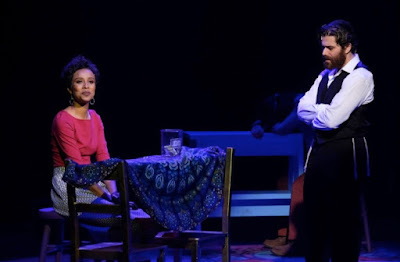 Anderson also played Tateh in Moonlight’s production of “Ragtime” moons ago. 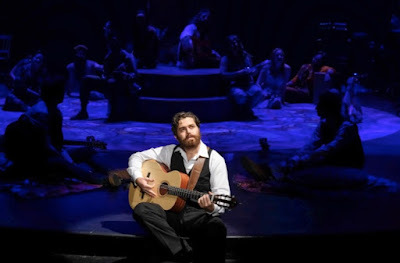 Anderson also won the NY Drama Desk Award in 2015 for his role as Shlomo in “Soul Doctor”. It transferred to off-Broadway in 2014 and closed in 2015. A re-write was definitely in the making. The large and talented cast, with almost all those participating playing at least one musical instrument, if not several showed their immense musical flexibility. In choreographer Jennifer Paulson-Lee’s movements there are segments of almost non-stop dancing, hopping and swirling keeping up a party like atmosphere. Rick Fox has several titles including music supervisor, orchestrations and additional arrangements. The music is definitely catchy. Kevin Anthenill’s sound design is especially sharp and Jeff Croiter’s lighting with its psychedelic changing colors resonating throughout is almost a trip back to the 60’s. 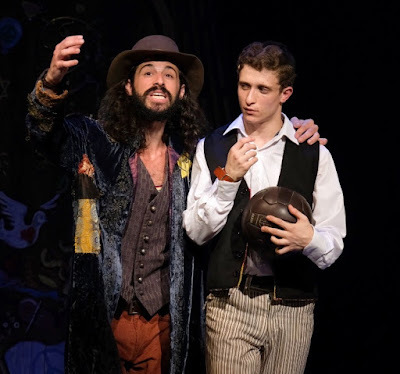 Gabriel Barrie charged with directing the entire mega love in, steers his actors in the right direction with enough movement on the stage to almost anticipate what’s coming next. Yours truly was amazed at the number of musical instrument displayed and the easy transition from character to musician. It’s a big musical love- in set on Edward Pierce’s hippie looking, pillowed strewn background with tie-dye designs and costumes designed by Jen Caprio. Carlebach remains the Reb. throughout with his Tzitzit (fringe) and Kipot always in plain sight. It’s a contrast in competing forces that seemed to work well for his followers. Josh Young embodies the title role after the young Shlomo (versatile and talented Dylan Hoffinger) goes through the motions of sharing his family life in Vienna only to turn over the reigns to the emerging adult Shlomo to Young as he makes his transformation from serious student to leader of his Brother’s and Sister’s on the world stage. 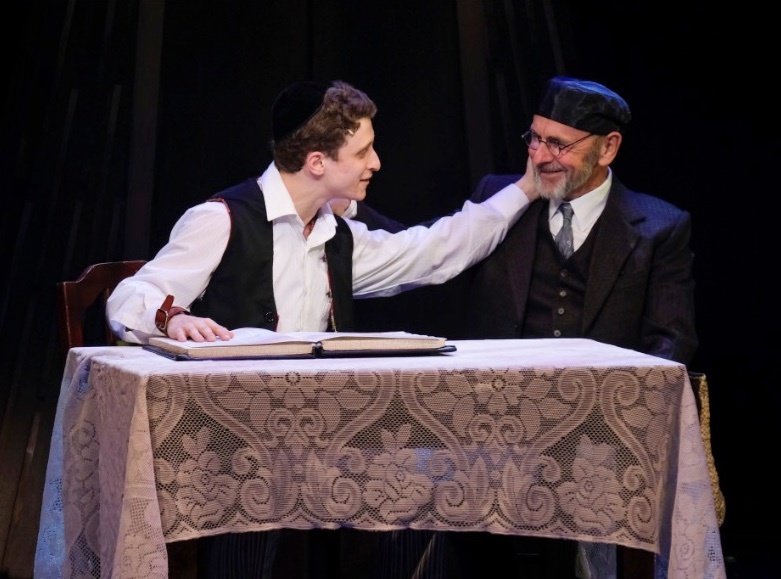 Credible performances are credited to Luke Wygodny as Mosheleh the Jewish ‘Holy Beggar’ who inspired the younger Shlomo to have faith and whose message was sadly snuffed out at the hands of the Nazi’s. Mimi Bessette is the caring and worried mother. Martin Rayner is perfect as his father who tries to steer his son in another direction for his own sake. Ester Rada is the charismatic and gorgeous Nina Simone whose legacy still resonates. They are the glue that holds the too long show together. They represent a truth we can count on for their views to create a believable thread to the man we all call “The Soul Doctor”. “Soul Doctor The Journey of a Rock Star Rabbi” is scheduled to move to Lose Angeles after our San Diego Run. Appealing to a population across the religious and cultural spectrum will need to show a leap of faith to continue its successful journey. If Shlomo Carlebach’s stories can appear side by side with those leaders of Chabad, his melodies entered with Israel’s annual Hasidic Song Festival, and his Hassidic teachings, which have been popularized and published, I guess we can have faith that his bio/play will have enough demand to spread around and reach out to all theatre lovers, hopefully in a shortened version.